Fueling the Fires has students examine the role wood played in the American Industrial Revolution. By calculating how much wood was consumed by U.S. railroads before and after the invention of wood preservatives, in addition to reading about the use of barbed wire for fencing, students will observe the connection between technology and forest conservation. Students also will learn how research and development have contributed to the diverse use of forest products in everyday household items. Image Caption: Railroads consumed vast quantities of wood. Crossties were hued and sawn by the millions. British Columbia Forest Service Photo. The student understands the connections among industrialization, the advent of the modern corporation and material well-being. The student understands the effects of rapid industrialization on the environment. The student will analyze the role that supply and demand, prices, incentives, and profits play in determining what is produced and distributed in a competitive market system. The student will show through specific example how science and technology have changed people's perceptions of the social and natural world, such as in their relationship to the lands, animal life, family life, and economic needs, wants and security. Download and print Module 3: one Teacher pages copy & one copy per student of the Student pages PDFs using Adobe Acrobat. Day 4 activity: Pre-class preparation: Click on "Object Cards." Place the items listed on the cards in five separate numbered containers or boxes. For example, box one should contain a packet of instant hot chocolate, a small package of tissues, and a container of glue. Make sure that the boxes or containers have lids so that students cannot see the objects until they are instructed to do so. Cut out the five "object cards," but do not place them in the corresponding boxes at this time. What role did wood play in the American Industrial Revolution? How can technology help conserve the environment? Name two products derived from the forest 150 years ago. Name two products derived from the forest present-day. Assign Worksheet 1 and Worksheet 2 and have students read the Essay in order to answer the questions. Distribute Worksheet 3 , “Notes", and “Photos”. The Photos page was created to look like an authentic piece of evidence (written by hand, fragments, and human errors such as a misspelling and a cross-out) so students would be exposed to the difficulties involved in examining historical sources. Optional: Worksheet 3 describes the contents of a box that has been found. Instead of merely handing out the contents (Notes and Photos), you could place these pages in a box to make the activity seem more realistic. Read aloud the scenario, problems, and assignment described on Worksheet 3 to familiarize the students with their work for the day. For this assignment students are asked to create a short television program describing the role wood played in the American Industrial Revolution. You might want to suggest some possibilities for completing the assignment such as a news report, documentary, interview, short movie, or even a music video. Additionally, allow students some flexibility when deciding how to create their program. For instance, some students may want to tape their show on a camcorder, others may choose to design a Power Point presentation, or some could act in a short movie or pretend to be news anchors. Depending upon the length of your class periods, this activity probably will run for 2 days (the first involving completion of the chart on Worksheet 3 and preparation of the television program and the second will allow time for each group of students to perform their program for the class). Distribute “The Railroad and the Tie”. Ask for a volunteer to read Part I aloud to the class. If the students have no questions, move onto Part II. Before arranging students into groups to begin the activity, carefully explain the sample graph provided on “The Railroad and the Tie.” Remind students that when graphing they need to label the “x” and “y” axes, provide a title for the graph, and make sure to use equal intervals when drawing a graph (for example, the sample graph used intervals of 10 years and 10,000 miles of track). Instruct students that not all line graphs will include a point for each interval. So, even if they have 7 years on their graph, for instance, they might only have data that corresponds to 5 of the years shown on their graph. Divide students into groups and distribute Worksheet 4. Allow students 20-25 minutes to draw their 2 graphs and answer the questions from Part IV of “The Railroad and the Tie.” Place a completed version of Worksheet 4 on an overhead projection to allow students the opportunity to check the accuracy of their 2 graphs. Ask a volunteer from each group to place the answers to the 3 questions from Part IV on the board. Go over the answers for each question so that students understand any errors they may have made. Pre-class preparation: Click on “Object Cards.” Place the items listed on the cards in five separate numbered containers or boxes. For example, box one should contain a packet of instant hot chocolate, a small package of tissues, and a container of glue. Make sure that the boxes or containers have lids so that students cannot see the objects until they are instructed to do so. Cut out the five “object cards,” but do not place them in the corresponding boxes at this time. At the beginning of class, divide students into 5 groups. Distribute one box to each group. Inform students that each of the items contained in their boxes are related somehow – allow students 5 minutes to hypothesize about the possible connection and instruct them not to show any of their items to anyone outside of their group! After 5 minutes, inform students that the connection between the objects is that they all come from trees; quickly review the vocabulary from Worksheet 1 that relates to this topic (resin, terpene, and cellulose) before proceeding any further. Ask students to keep a week-long inventory of household items derived from trees that they and their family use on an everyday basis. The list should contain 15 items, but should not include any of the specific items already discussed in class. Instruct students that one way to discern if a product comes from a tree is by reading its ingredients. Write the following tree derivatives on the board or an overhead sheet for students to copy: cellulose (or any form of cellulose such as cellulose powder, gum, or methylcellulose); eucalyptus; cedar oil; pulp; balsam; lemon peel; citric acid; carnauba; resin; camphor; esters. Warn students that even though many household items contain one or more of the above derivatives, some products, most especially household cleaners like Windex and Palmolive, do not always reflect this information on the label. Encourage students to use “Goods from the Woods” and “Products from the Woods” from the Links section of the activity if they need help completing their inventory. At the end of the assignment ask students to share a few of the items from their list with the rest of the class. Choose from one of three types of activity assessments. Have students research the history of a railroad company in their local area or state. Ask students to focus on how this company used wood in its operations during the nineteenth and early twentieth centuries. As a follow-up, invite an employee from this company (if still in existence), or another railroad company, to speak to the class about the role wood plays in their modern operations. Students learned in this activity how technology helped preserve American forests through inventions that curbed wasteful use of wood. In order to test students’ understanding of this phenomenon, stage a competition in which students are asked to design an invention that would help preserve trees or improve a modern practice involving the use of a forest product. Have students research the development and location of railroad lines in their state, including the major starting and ending points, the dates on which construction both began and ended, and the reasons behind the choice of the locations for the lines. Additionally, ask students to identify the products transported by the railroads in their state during the late nineteenth and early twentieth century. Finally, have students make a list of the products no longer carried by railroads and ask them to speculate as to why these products are not transported today. Technology: Instead of having students compose graphs for Worksheet 4 on the sheet provided, ask students to create their graphs in Microsoft Excel or similar software. English: Worksheet 3 asks students to create a 5-minute television broadcast about the role wood played in the American Industrial Revolution. As an additional component of this exercise, have students write a script for the broadcast outlining the important topics and issues. Math: Since Worksheet 4 incorporates math skills, this exercise could be introduced in a social studies class and completed in a math class. Alternatively, math teachers could build on the exercise by having students compose more complex graphs and answer questions that test understanding of the information conveyed by the graphs. Science: Using the essay and Worksheet 5 as a guide, ask students to compose a list of wood derivatives (cellulose and resin, for example). Assign students one or two derivatives and ask them to research its physical and/or chemical composition and explain the process of how this material is used in the production of everyday household objects. Bramwell, Martyn, ed. The International Book of Wood. New York: Crescent Books, 1984. Bumgarner, Matthew C. Legacy of the Carolina & North-Western Railway. Johnson City, Tennessee: Overmountain Press, 1996. Christian, Bill. “The Story of the Railroad Tie.” Forest World (Summer 1990): 10-13. McCallum, Henry D. and Frances T. The Wire that Fenced the West. Norman: Oklahoma University Press, 1965. Olson, Sherry. 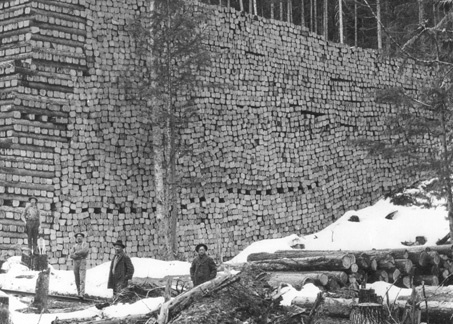 The Depletion Myth: A History of Railroad Use of Timber. Cambridge, Massachusetts: Harvard University Press, 1971. Williams, Michael. Americans and Their Forests: A Historical Geography. New York: Cambridge University Press, 1989. Forest History Society Bibliographic resources on forestry, conservation and environmental history. North Carolina Forestry Association “Goods from the Woods” contains information on forest products. The Library of Congress (American Memory) Extensive collection of railroad maps from 1828-1900. Railway Tie Association Publications and links about the history of railway ties. Forest Products Laboratory Detailed reference source for forest products.